Chatting with friends and customers has made me acutely aware of why it is important for people to understand the basics of metal working. Having insight into how a metal object is made allows you to better understand a piece, whether you are doing research, ordering a custom piece, or buying an off-the-rack item. There are a number of methods used to shape metal for utilitarian purposes, decoration, and personal adornment. Using a hammer on metal is one of the oldest techniques used to shape metal – so the first blog will be on stamping metal. What do we need to stamp metal? A hammer, a surface to hammer on, a stamp, and the metal that will be shaped. Let’s start with the stamp. Stamps are usually made by softening a piece of steel, shaping the stamp, and then re-hardening the steel. How does all of this softening and hardening take place? Heat! The process of making the steel, or any other metal, softer is called annealing. The metal is heated to an appropriate temperature, which varies from metal to metal, and then allowed to cool slowly. This process removes the stress that is left over from manufacturing and softens the metal. Why does removing the stress from manufacturing the metal matter? The stress in the metal affects the way the metal behaves when you work it by hammering, compressing, or bending. Stressed metal can crack or chip when you work with it. So the steel for the stamp has been annealed. Now it can be shaped to make the design that you want, using drills, saws, and files. Once the shape of the stamp is correct, the steel is reheated. This time it is quenched, usually in oil. This process is called tempering. It hardens the steel in a specific way, which makes it hard, but not too brittle. Most people purchase their stamps. It’s also important to know that some metals like brass can not be hardened by heat treatment – they’re generally not good to use as a metal stamp. Let’s talk about hammers. DO NOT use a hammer with a hard steel face, like a framing hammer. Why not? Well, two reasons. The first is that the face of the hammer can actually chip and throw pieces of metal, which can be dangerous. The second reason is that a hardened hammer head will place more stress on the stamp and tend to cause the top of the stamp to spread, also called “mushrooming”. You might have seen a tent stake with a “mushroomed” head caused by hammering it. Relax, this will eventually happen to stamps used to decorate metal to some extent, but there is no need to speed up the process. What sort of hammer should we use? Your best options are a Brass or Copper headed hammer or mallet. The Brass or Copper heads are much softer than the steel of the stamp and will not damage the stamp. The advantage of using a mallet is that the weight of the mallet will do a lot of the work for you and put less stress on your arm. What sort of surface do we use to do the stamping on? Well, the best surface is some sort of smooth metal, usually a metal block or an anvil. You want to have the full force of the hammer transfer to the stamp and then into the metal sheet. 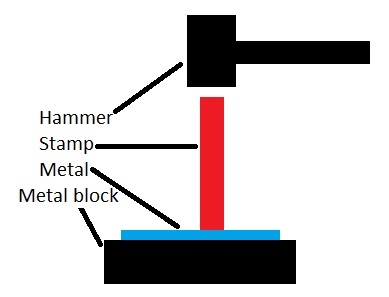 Having the metal that you are stamping backed up by a smooth block of metal means that the force from the hammer is focused into the metal sheet and creates a crisp image. Equally important, the metal is not marred by an uneven surface. The graphic shows the basic arrangement of tools for stamping. 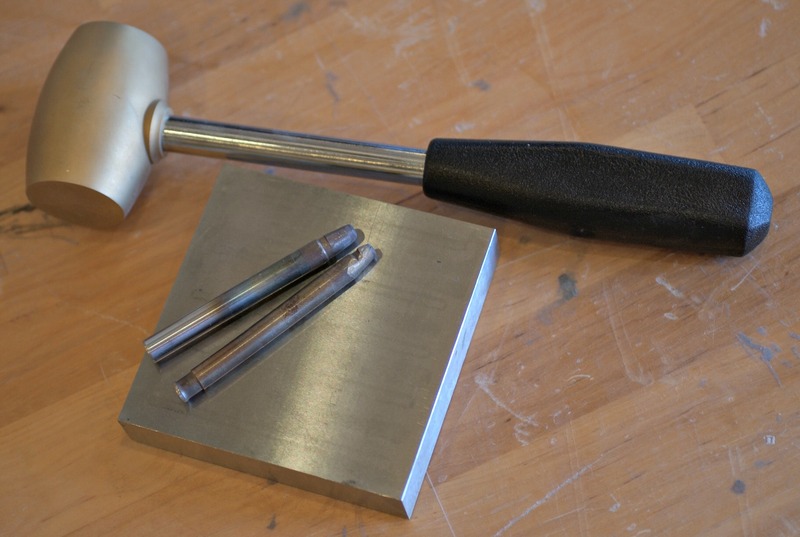 This picture shows some of my favorite tools for doing stamping. I hope that this information makes both your purchases and your research more interesting and productive. Next time: Chasing and Repousse!